Next Perth show March 16 at Amps so catch yas all then! 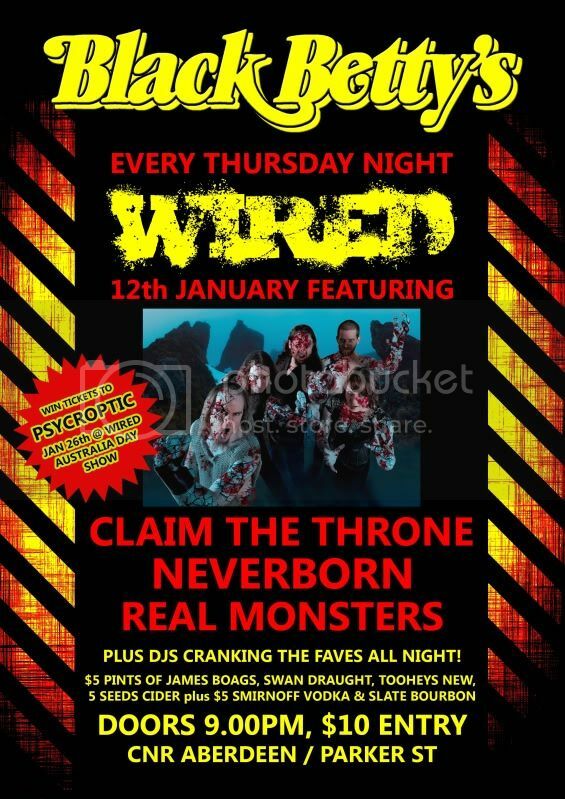 WA Gigs / Re: Wired Thursday 12 Jan. Claim the Throne, Neverborn, Real Monsters. Musician Connection / Re: Being a Musician is too expensive..
Hey there you dirty raiders! Just a quick one to thank all who helped make 2011 a great year for Claim The Throne. Triumph And Beyond came out in Dec 2010 and we have sold more copies than we could have wished for. Thanks to everyone who brought it, downloaded it, reviewed it, advertised it, learned lyrics from it, uploaded stuff from it, kissed it, ate it etc. The response has really made it feel worthwhile writing music and playing shows, so can?t wait to get the next one out! We toured the country with Finntroll in March, an amazing opportunity for us to play in front of new and bigger crowds, as well as catch up with some familiar faces. Thanks for coming to those shows early and watching us, headbanging, buying merch and having a chat. Then in September we raided the country alone for three weeks. There were some big shows, some small shows, heaps of new places, lots of great people, and a bunch of killer bands. Thanks to everyone who supported us along the way ? punters, promoters, friends, and all who lended a hand you know who you are. It was also our first time over to New Zealand and a lot of regional places throughout Australia. Then four Bastardfest shows throughout the trip was a huge amount of fun, we are so stoked that we had the chance to be involved in these events. Amongst those highlights, there were of course countless live shows in Perth, we must say thankyou to everyone who continues to support us and the local metal scene. Looking forward to our next chance to get drunk with you all! 2012 is looking to be another massive year. In February we are heading to the UK for a 16 date tour with Alestorm, a huge opportunity to increase exposure for ourselves and the Aussie metal scene. We will also be recording a new album which we hope to release during the year, so listen out for a few new tracks at gigs coming up soon. With all of the above in mind, we are super broke. Our stockroom is filled with leftover merch that we?d love to offload. CDs, shirts, hoodies, g-strings, stubby holders, posters and plenty more going very cheap. All orders help us immensely, so if you?re so inclined please head to http://claimthethrone.bigcartel.com and grab a bargain, we?ll chuck in free stuff wherever we can. Everyone, thanks again for all the support and for making 2011 an awesome one! Legendary Romanian black/folk metal band NEGURA BUNGET are heading down under for the first time ever to headline Australia's biggest metal festival SONIC FORGE FESTIVAL, and whilst in Australia the band will be doing a large run of sideshows across the country! Tickets on sale soon! Ticketing details announced shortly! WA Gigs / Re: DEC 23rd Claim The Throne Xmas Show @ Amplifier Bar! How was the setlist? A bit of everything? Claim The Throne's conquering Australian and New Zealand raid starts tomorrow night in Perth! Be sure to plunder your way to Amplifier Bar for a massive night of metal and partying, a chance to celebrate just how huge the local metal scene is! Also playing are Adelaide metal giants DOUBLE DRAGON, Perth thrashers PSYCHONAUT, and of course the EP Launch for DEVOUR THE MARTYR! The night will also be filmed for a CTT future DVD release so be sure to come along and help us make it as crazy as we can! New merch available all night. Doors open at 8pm. Also remember our tour competition closes VERY soon, winner to be announced this Saturday. So head to our Facebook page to see what it's all about, and let us know your best ale tale, you just might have a good enough story to win yourself a pack of 3 CDs, tour shirt, signed poster, cap, stubby holder, Gstring, guitar pick & keyring! Hope to see all you tomorrow night! Claim The Throne's upcoming Aus/NZ Raid begins this month! To celebrate this triumphant time, here is your chance to win a massive Claim The Throne prizepack! Entries must be posted on the CTT Facebook wall. Winning entry will be announced on the page Saturday 13th August. Be creative, make us laugh, and come for a drink at the upcoming shows! Lee your potty mouth is really offensive, for fucks sake. Bring us some Coopers and mexican food. Red Descending with new lineup and new songs. And crow noises and whale sounds. Pretty sure theyre confirmed. Which is a shame because I never wanted to go to Soundwave ever again, but now I will have to. Next battle takes place tomorrow night at Rosemount Hotel with a local lineup of invincible proportions to raise shillings for the disasters in Queensland. Voyager, Chaos Divine and Empires Laid Waste will help us pillage the city from 8pm, proceeds going to ?Premiers Flood Relief Fund?. And creeping up very quickly is the first Australian Tour for Finntroll! We can?t wait to get rowdy and visit the east coast again with a new album and improved funnel skills. New merchandise, including tour shirts, will be available at all shows. Tickets on sales now! We can also promise a Claim The Throne national tour later this year, visiting a heap of places we have never ventured before, so keep an eye out for some tour dates! Our latest album TRIUMPH AND BEYOND is still available through PRIME CUTS MUSIC, and now also distributed by MODERN INVASION MUSIC, meaning it will soon be available in a store near you! Thanks to all who came along to support us, or abuse us, or just to get drunk. Great turnout and great atmosphere, couldn't have wished for a better way to launch the album. Gallows, Wardaemonic, Born Into Suffering - all tops.